Congratulations! Your big day is quickly approaching. There is so much to do, so much to plan. The details are endless but the planning is half the fun! Even though, at times it may get overwhelming and stressful, remember in the end it will all be worth it! Your day will be everything you ever dreamed of. As you go through the stages of planning, you book your venue, try on wedding dresses, and have your hair and makeup consultations booked. Have you considered a plan for your nails? Having your nails done may not rank as the most important thing on your wedding plan list. Maybe you will just do your own nails or have a friend do them for you. At Debony Salon, nails are an important part of the services we offer and we’re excited to offer manicures and pedicures for single brides and bridal parties. Your hands will be front and center in all your wedding photos, and throughout your special day people will be grabbing your hands. Nails are a detail that you definitely want to prioritize. Your hands will never receive as much attention as they do on your wedding day. Here at Debony we offer bridal party packages. Whether it’s just manicures, pedicures or both we are here to help with all your nail care needs. It’s always fun to get your nails done with your girlfriends, bringing everyone together the day before you say ”I DO”. Sharing in some good girl talk, last minute wedding advice and lots of laughter, let your girls come together for this one final hoorah before the big day. Many will turn this into a little party having a light lunch catered in. It can also make for a wonderful bridesmaid gift. 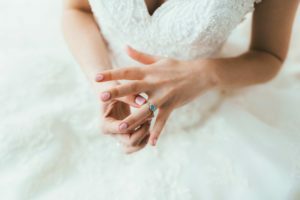 While we have definitely seen some major changes in fashion with wedding gowns and hairstyles one thing has always stayed consistent when it comes to bridal nails; is the classic bridal manicure. 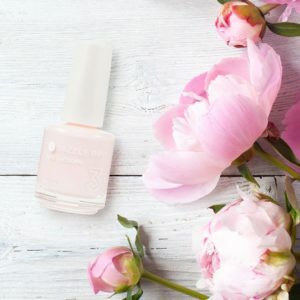 A solid color a pale pink or a soft cream, a french manicure or a soft metallic. Those are among the most popular however some fun trendy ideas are adding in some sparkle, or some glitter. Some brides like to make a more bold statement adding an element of surprise maybe a pop of color, or an accent nail. Whichever style suits you we can meet your needs and what ever dream you envision. Contact Adina Gagne, our Wedding Coordinator to plan your bridal nail party. We can help you take care of any of your beauty bridal details or click here for more information on Debony Salon’s wedding services. We look forward to being apart of your special day. So stop in let us make your day because in making your day, its makes ours! PreviousPrevious post:Give Your Feet Some Love With a Spa PedicureNextNext post:April Newsletter from Debony Salon!